Green Velvet Cupcakes with Cream Cheese Frosting - cupcakes made with cake mix, buttermilk, green food coloring and topped with homemade cream cheese frosting. Perfect for St. Patrick's Day! 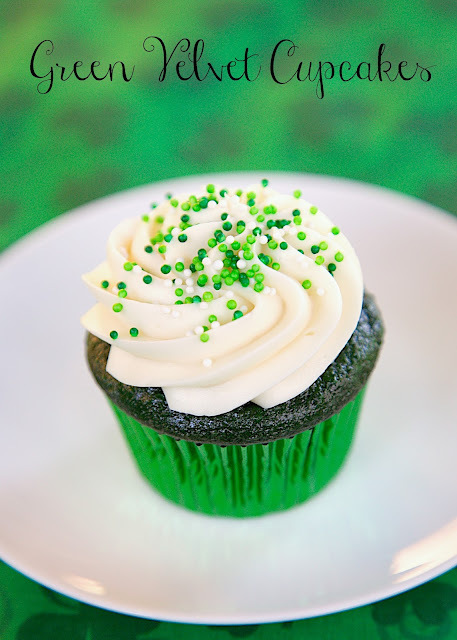 You must make these cupcakes even if you don't celebrate St. Patrick's Day. They are SO good. The cake is great, but the frosting really puts these cupcakes over the top. I loved the green color. They are so cute and festive! I doctored a box of Duncan Hines Milk Chocolate cake mix for these cupcakes. I used the milk chocolate cake mix because I thought the green color would show up better than with devils food cake mix. I think German Chocolate cake mix would work well too. Also note that these cupcakes use a whole 1-ounce bottle of green food coloring. Just dump the whole thing in the batter. 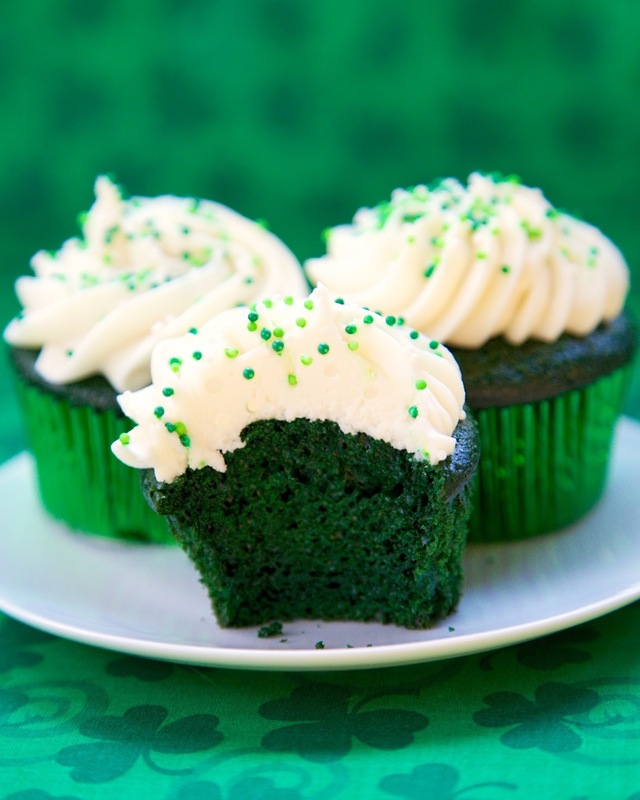 It gives the cupcakes a great green color! Preheat oven to 350ºF. Place paper liners in cups of muffin pan. For cupcakes, combine cake mix, buttermilk, oil, eggs and food coloring in medium bowl; mix according to package directions. Using a large scoop, drop heaping scoops of batter into muffin cups. Bake 18-22 minutes. Cool cupcakes completely. For frosting - beat cream cheese, butter, sour cream and vanilla with an electric mixer until light and fluffy. Gradually beat in powdered sugar. Spread on top of cupcakes. MY CUPCAKES! Thanks again for so sweetly sharing these with our family. :-) We still remember them fondly. These look amazing. Ok, here's a stupid question for you: what did you use on the frosting to make it pretty like that? did you use a piping gun or something? I want to try these, but don't want my normal knife smushed frosting look. :) Thank you! I used a piping bag and tip to pipe the icing on. I used a really large star tip. You can get one at Michael's. The frosting in the photos is what is written above. Not sure what you did wrong, maybe your ingredients were too soft? Did you use the whole box of powdered sugar? If you made it with the ingredients listed above, it wouldn't have been a glaze. What type of oil do uyou use? Made these yesterday for St. Patrick’s Day, they were amazing!